If you need daycare, pickup from local Nursery classes, before and after School care or Holiday clubs in the Northchurch area. Give us a call or email we are your local small independent daycare provider. 30 Hours funding available (Flexibly) book early for your Autumn term funding now. Easter Holiday club, book your places now. We provide seamless care from babies to year 6, the complete service. Open 50 weeks of the year, closing only at Christmas. Home from Home kindergarten is a small family run organisation which opened in 1995. Caring, highly qualified experienced staff. We are a small family run organisation offering a Day nursery, Out of School & Holiday Clubs located in Northchurch on the outskirts of Berkhamsted, near Tring and Hemel Hempstead. We are located in a rural part of Hertfordshire benefiting from large open countryside. 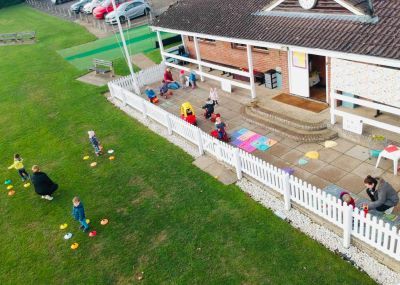 We have 2 separate locations within a short distance of each other, our 9 months to 4 years nursery is located at Northchurch Cricket Pavilion. Our Out of School and Holiday Club is at Westfield School. Please have a look around this site to gather any information you require for your childcare needs, you can download our prospectus, information booklets and application forms from our Contact us page. Please contact us should you wish to arrange a visit to any of our provisions. Here is our Easter Holiday Club Activity list.